These amazing looking animals only grow to about 7 cm long. They get their name because they look like they are dressed for bed. 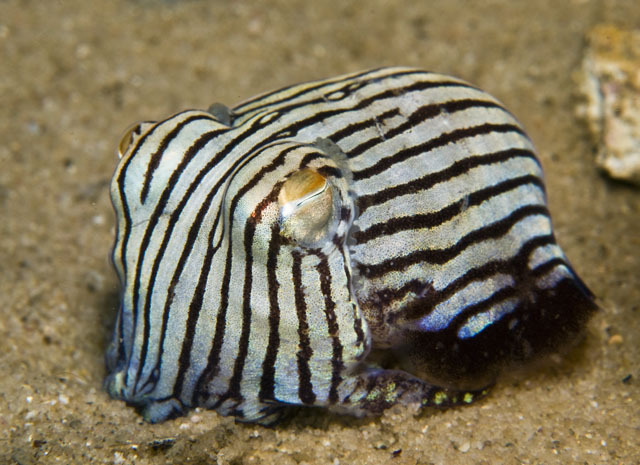 Striped pyjama squid aren’t actually a squid, but are a type of cuttlefish. They are very sneaky hunters, hiding under the sand with only their bright yellow eyes showing. This helps them to ambush their prey, which includes small fish and shrimp. To protect themselves from predators, when threatened they can produce a slime that scientists think may be toxic and surrounds their body. Striped pyjama squid can be found in shallow waters off the coast of eastern, southern and western Australia. Are there any other interesting facts that you would like to share about striped pyjama squid?